Following the demise of former Vice President Alex Ekwueme, a huge vacuum has been created in Igboland. Prior to his demise, the people had been agitating for relevance on Nigeria’s political scene which they claim has been denied them since the civil war. Although he was gentle in his approach to things, Ekwueme’s action was louder than the many voices speaking across the Nigerian political system. He was active as vice president according to former President Shehu Shagari under whom he served between 1979 and 1983. In his tribute, Shagari said Ekwueme was a vice president he trusted and that no one could put a wedge between them, saying it was for that reason he had to choose him as his deputy for the second time after his re-election in 1983. That was before the 1983 coup? But despite the injustice meted out to him after their regime was overthrown, Ekwueme did not give up. He collaborated with fellow politicians to force the military out of governance and tried to be President in 1999 but was betrayed when former President Olusegun Obasanjo was brought out of prison to be imposed on Nigerians. Ekwueme was not a man to give up on his dreams for a better Nigeria, hence he spear-headed the creation of the six geo-political zonal structure and power rotation along the North-South divide. Indeed, restructuring has become imperative in Nigeria in order for it to remain one united country. Every regime has been confronted with the agitation for the restructuring of Nigeria to give room for peaceful co-existence among Nigerians. The average Igbo believes he is suffering because the civil war of over 50 years ago never ended. But people like Ekwueme had always given the Igbo hope. So, what will give the Igbo a sense of belonging in the system especially with the exit of a man who worked so hard for a harmonious relationship in Nigeria? Dr Orji Uzor Kalu, a chieftain of the ruling All Progressives Congress, APC, and a former governor of Abia State, is optimistic that the Igbo would be President in 2023, and not 2019 when many Igbo would have loved it to happen, after President Muhammadu Buhari’s second term. Kalu has, therefore, urged the Igbo to support Buhari and his re-election to achieve the dream of Igbo presidency in 2023. He asked the Igbo to learn from their past political experience. “The future of the Igbo in Nigeria politics is brighter now in APC than ever before and producing an Igbo President is a task every true Igbo indigene must key into and APC is the best platform to achieve the dream”, he said. “The future of Ndigbo is brightest today in APC. Once Buhari finishes his second tenure, I am assuring you that either I or any other Igbo man stands a better chance of becoming the President of Nigeria. The right thing to do is to work for the presidency. But the General Overseer of Mount Zion Faith Global Liberation Ministries lncorporated (aka By-Fire-By-Fire), Nnewi, Anambra State, Bishop Abraham Chris Udeh, does not have faith in Buhari handing over to Igbo in 2023. “It was Ekwueme’s favour to Ndigbo that led to the military coup-de-tat carried out by General Muhammadu Buhari in December 1983 and ever since Ekwueme left the corridors of power, no other Igboman has been allowed to smell the seat of power as either President or vice, except Commodore Ebitu Ukiwe who held sway as Chief of General Staff but was removed by Babangida within a short period of time because he is an Igbo man”, he said. “It was out of hatred that the Buhari administration proscribed the Indigenous People of Biafra (IPOB) and tagged it a terrorist group while giving free hand to killer Fulani herdsmen who have been terrorizing farmers to continue to operate as they like. Don’t you wonder why Buhari refused to restructure the country and why he continued to see IPOB as a terrorist group? “I hereby call for the separation of Nigeria. Everyone should walk away. After all, what are herdsmen contributing to Nigeria? Rather, they are on their own personal business and have nothing valuable to contribute to national affairs. “Why should they be allowed to kill people, launching a jihad and using it to Islamize Nigeria? The military dropped the 1960 constitution and replaced it with the constitution that favoured them. On its part, the Igbo National Council, INC, believes the Vice President slot should be zoned to the South – East in the next elections. A former member of the House of Representatives, Nze Chidi Duru, sharing his own perspective on the Igbo presidency project, said “Ekwueme’s death has created a vacuum”, but believes a true leadership will emerge in Igboland in due time. Duru went on, “Concerning politics, as we see it today, for the cohesion and harmony we need in our political system, after the North has occupied the presidency for eight years, it will be the turn of the South and the logical thing is that the Yoruba and the South-South having exercised power in recent past, it is the natural turn of the Igbo. “The argument of Igbo politicians in the APC is that after eight years of Buhari, power is expected to rotate to the South and, naturally, the Igbo will have it. To Dr Chukwuemeka Ezeife, a former governor of Anambra State, one of the biggest problems of Ndigbo is negative thinking. “Who said that we cannot get the presidency in 2019?”, Ezeife said. “To me, 2019 is easier than 2023, because neither APC nor PDP is in a position to win the presidency. This is the best chance for Ndigbo. APC should be completely out of the picture whether it is 2019 or 2023. Igbo people have made up their minds. Buhari should not contest again. APC or PDP stands no chance of producing the President”. Chief Charles Udeogaranya, an APC presidential aspirant, shares Ezeife’s sentiment. Although as associate of Buhari, he thinks the Igbo need now and not 2023 to aspire for the presidency because the North will never hand over to an Igbo man. “I’m a member of the APC and have since declared my presidential ambition. It is politically naïve for anybody to think Buhari will hand over to an Igbo in 2023. The Igbo has not been in the picture since the civil war. Just look at it this way, it was the hope of Ndigbo that Shagari will hand over to Ekwueme in 1987 had he completed his term in office but that was contemplated by those who overthrew Shagari’s government in 1983 and that opportunity slipped”, he told Sunday Vanguard. “Then came 1999 and just to stop Ekwueme from emerging the presidential flag-bearer of the PDP, Obasanjo was brought out from prison and used to truncate Ekwueme’s ambition. The Igbo should not be naïve and believe Buhari will hand over to an Igbo man. He would never do that. Power is taken and struggled for and not given. The time for Ndigbo to produce Nigeria’s president is 2019, not 2023 because, in all ramifications, a new President must emerge in 2019. So, there is no option of 2023. God willing, I, Udoka Charles Chukwugozie Udeogaranya, shall emerge as Nigeria’s President come 2019. 2023 is too far. It is not what we want. I am in APC and I want support to contest in the primary against the President”. Told that it is only two and a half years into the life of this administration and that many people consider the 2019 politics a distraction to governance, he said, “I consider it a noble idea for one to seek to serve his or her nation in an elective position. However, for you to serve, you have to be elected and, for you to be elected, you have to convince the electorate on what they stand to benefit. So you can see that a rigorous and lengthy time is involved. This is the simple reason why in the US presidential election, it takes almost two years from the time the candidates announce they are running to the day that one of them will be sworn into office. This is to allow the candidates to sell themselves properly to the electorate and I am happy that INEC understands this and has just directed that all party primaries for the 2019 general elections be held before May 15, 2018. So we are even running late and it shouldn’t be distractive to a government that ought to have the good understanding of this”. On the statement credited to Ohanaeze Ndigbo that, in 2019, the South-East will support only the presidential candidate that pledges to hand over power to the zone in 2023, he said that was not the position of the Igbo group and could not have been because Ohanaeze Ndigbo is pained and unhappy that since 30 years of our democracy and 50 years after the civil war, no Igbo had been elected President or had been allowed to preside over Nigeria in any setting, in spite of their contribution to national development and population size. “So your interpretation is flawed”, he said. “The correct position of Ohanaeze Ndigbo is that if APC nominates me, a South-Easterner, as their presidential candidate, then Ohanaeze will back APC and would not need to enter into an agreement with APC because Ohaneze wants a Nigerian President from the South-East, if possible, tomorrow morning”. 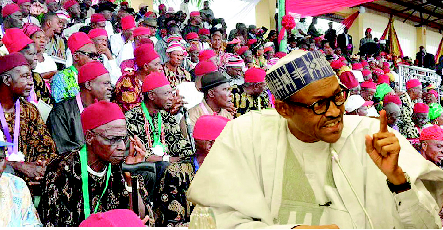 The post EKWUEME’S EXIT: Igbo leaders disagree on Buhari’s re-election appeared first on Vanguard News.